President Isaias Afwerki said that the ‘21 January 2013 incident’ was, and is no cause at all, for apprehension and that the Government opted to remain silent regarding the matter so as to give no ground for the authors of sheer lies. The President told ERINA that it was natural for the Eritrean people inside the country and abroad to seek information about the situation since the very hours of the incident out of patriotic concern. He further elucidated that the Government of Eritrea deemed it fit to refrain from issuing statements in haste, as doing so is not only outside of its political culture but also would mean serving the ploys of bankrupt enemy quarters. 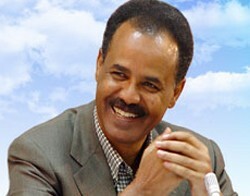 President Isaias went on to indicate that the Government would provide the necessary information at an appropriate time. “Entertain no worry at all, as there was – and does not exist – any reason for being apprehensive,” the President underlined. "Seems a deliberate campaign of defamation on Eritrea is unfolding. I just read the story below: ''Eritrea slammed over Al Jazeera ban''. I was today at the Asmara Central Post Office. Al Jazeera English TV was on for customers to view, while awaiting to be served. So, who is punting such lies?? Mr ambassader why are you new to the game this is note new at all it has been and it is going to continue to find ways to destroy eritrea as the nation.